Welcome to the Week 4 Challenge for So You Think You Can Decorate. This week's challenge is to use the color white. "No problem", says I. I just love white!! Our Master Bedroom has received no love at all since we moved into our house a little over 2 months ago. My plan was to use a large dose of white in this room. Perfect for the week 4 challenge!! Here is a before photo...and a perfect example of how NOT to use the color white. 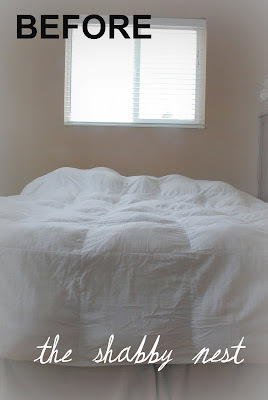 No headboard, no curtains, lumpy-bumpy comforter. It reminds me of a bad dorm room...with the exception of the color on the walls. And because we are renting our home, the wall color had to remain...providing a little bit of a challenge, but I love a challenge! Wow! That's a tall order...but here we go!! Now here is an after photo....hard to believe it's the same room, huh? 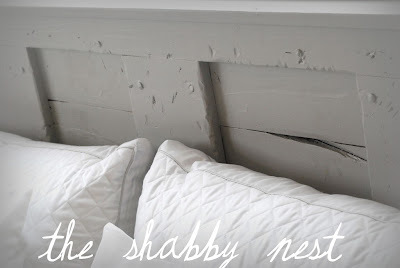 I wanted to use a piece of architectural salvage as a headboard. So off I went to the only architectural salvage store in the surrounding area. I decided to use an old 5 panel door. The problem was the price. Just a little more than I wanted to pay. Enter my dear husband who built me a "5 panel door" headboard out of a bunch of old wood in our storage room. We painted it out in a pale dove gray to match the gorgeous curtain panels I found. Here is a closer view of the headboard. Join me here later this week, when I'll go into more detail about our design process and how we put this together. 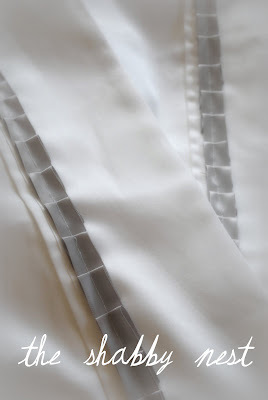 I purchased the drapery panels ready-made from IKEA and actually ended up saving a lot of money over the amount I would have spent on fabric to make the same extra long curtains. I hung them at ceiling height to make the room seem taller. The curtain rods I used (not pictured...sorry) were pretty much the least expensive ones they had at IKEA...problem was that they were black...so I just spray painted them with Krylon spray paint in a brushed nickel finish...problem solved. The bedding is the thing that really makes the room and ties the whole color scheme together. I added the tan burlap pillow and the pillow with the crown motif to tie in the color of the walls. The pillow with the vintage french photography graphic ties in both the tan and gray colors while the charcoal pillow punches up the gray in the color scheme. The pretty rosette pillow finishes the grouping. One of the keys to using white in decorating is texture. The lovely coverlet on the bed adds that element beautifully and makes the entire bed seem elegant but comfortable. Here is a close up of the ribbon detail on the pillow cases. Join me later this week and I'll tell you more about these as well. 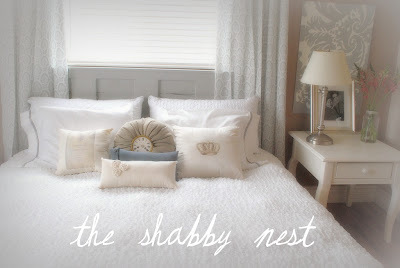 Now our neglected Master Bedroom is a pretty white retreat to relax in at the end of a busy day! Please take a minute and go vote at So You Think You Can Decorate, you won't be disappointed! Clock pillow was won in a drawing here. 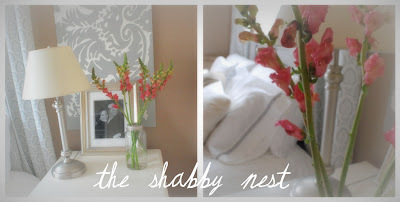 You did an amazing job transforming your master bedroom into something very special! Wow, Wendy! You did a fabulous job in here! I love the headboard and the drapes! Your artwork is a nice bit of pattern added to the mix ~ love it! I did to see how you created that headboard. We need one badly! The wall behind our bed has lots of water damage from the mold and bad windows (rental). This is a beautiful sophisticated look. I truly love it! Let's see, how far away from me do you live??? LOL! You have the talent girl! Great job! It looks heavenly. 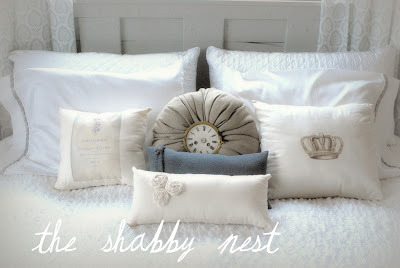 WOWWWW...I'm in love with the clock pillow and the headboard. I can't wait for the door headboard tute. Did you make the pillow??? Oh, it looks so pretty! The pillows are the perfect touch. It is absolutely GORGEOUS!! You definitely have made your bedroom a wonderful, relaxing retreat! Your room turned out FABULOUS!! I hope when you post the tutorial on the headboard that you will include the name of the color of that grey paint (love it). What a peaceful space... this is simply gorgeous Wendy. The pillows add detail and the headboard is simple, but full of character. Well done! Your makeover is amazing - and especially for a rental! I remember those days when you couldn't change anything so this must have been quite the challenge for you this week. Great entry! I'm loving this contest so hard! Gorgeous Wendy! The one thing I gasped at was the way you displayed your flowers. The glass against the galvaized lid with a spash of colour.. so lovely. You've created yourself a beautiful haven! Sooo beautiful, girlfriend! Love that headboard the very mostest. So beautiful! Love the pillows and how you displayed the flowers! Beautiful room! 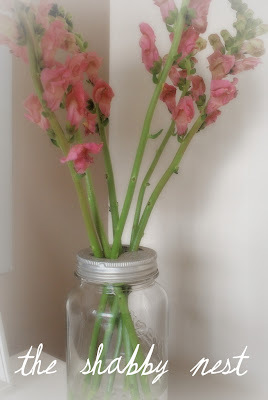 just blog hopping and found your lovely blog! Hello Wendy - what a beautiful post! I love the way the room turned out. So soothing and pretty. All the right touches! One word (and from an irish girl that is saying something!) - WOW!!! Looks so restful... Could you please tell us some more - like what the name of the drapery panels were from Ikea? And how you made that painting? And what is up with that canning jar lid? The room is just amazing - it is so soothing. I really love the headboard! Wendy your room is just lovely and soothing. Another outstanding bedroom!! You can change your challenge to "I CAN Decorate"!!! Love the room and so frugal of you! Just goes to show what you can do with a little imagination...and a small budget :) I especially love the headboard. I need one for my king bed but DH, unfortunately, is not too good with building anything. Absolutely beautiful! I love the headboard! Just lovely. What a pretty room, I don't know how I missed it before! Love it! 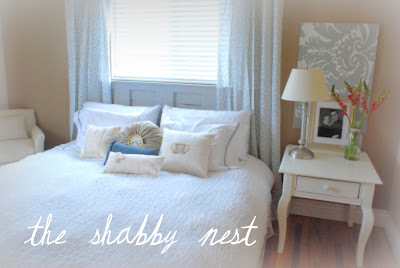 This makes me want to spend New Years weekend making my master bedroom all white and dreamy. You have absolutely inspired me to put some wallpaper on the wall behind my bed. Your room is amazing.